Wondering what to do with leftover turkey? Look no further than this deliciously hearty soup! Grab the leftovers and add some fresh herbs and broth and head to your slow cooker for a nearly effortless dish that the whole family will enjoy. Or take a look at the stovetop instructions if you need a faster soup. Serve the soup with crusty French bread or biscuits. It's an excellent lunch soup as well. Add a sandwich or salad for a well-balanced meal. Heat the vegetable oil in a skillet over medium heat. Add the onion, celery, and sliced carrots to the hot oil and cook until the onions are softened, stirring constantly. In the slow cooker, combine the cooked vegetables, chicken or turkey stock, turkey, barley, bay leaf, thyme, marjoram, and pepper. Cover and cook on low for 6 hours, or until the carrots are tender and the barley is softened. Taste and add the chopped parsley; adjust seasonings with salt, as needed. Heat the vegetable oil in a Dutch oven or stockpot over medium heat. Add the chopped onion, celery, and carrots. Cook until the onions are translucent, stirring constantly. Add the chicken or turkey stock, turkey, barley, bay leaf, thyme, marjoram, and pepper. Bring to a simmer. Reduce the heat to low and simmer for about 1 hour, or until the vegetables and barley are tender. Stir the chopped parsley into the soup. Taste and season with salt, as needed. Pearl barley cooks more quickly than hulled barley, but hulled barley is richer in fiber because it is the whole grain. Hulled barley retains its chewy texture, but might need an extra 30 minutes to an hour of cooking time. The soup starts with the typical mirepoix of onion, carrot, and celery. If you prefer Cajun and Creole flavors, add a chopped green bell pepper to the mixture and season the soup with Cajun or Creole seasoning. For Creole flavor, add a 14.5-ounce can of diced tomatoes. 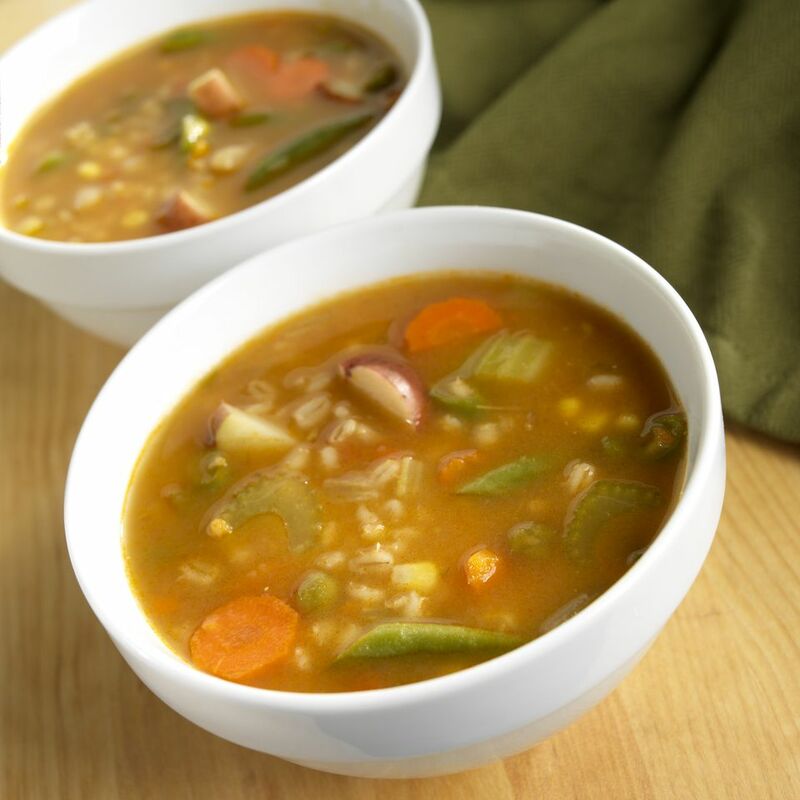 If you like more vegetables in your soup, add a cup or two of frozen green beans, corn, or lima beans about an hour before the soup is ready. Feel free to replace the pearl barley with hulled barley, farro, or whole grain sorghum. All of these grains hold their shape well, even after long, slow cooking.